DAT Optic Infiniband to eSATA 4x Fan Out Cable High Performance Fan Out Cable Infiniband to 4x eSATA fan out cable attaches to any controller card that has a thumb screw style inifiniband connector. Fanout style cable allows connection of four eSATA devices to one infiniband connector. 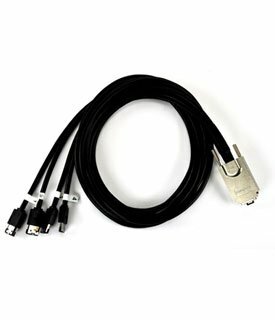 With thumb screw type connector and heavy external shielding cable, this infiniband (Multilane SATA) cable provides a data path free of RFI or EMI. It is a perfect cable for a demanding high speed transfer bus. If you have any questions about this product by DAT Optic, contact us by completing and submitting the form below. If you are looking for a specif part number, please include it with your message.